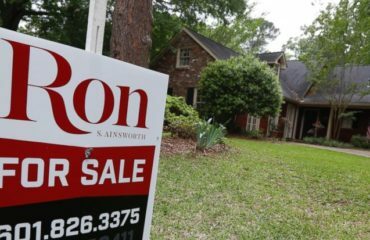 Residents of Hell in Michigan have experienced temperatures as low as minus -26C, according to the National Weather Service, as northern states are gripped by a deadly Polar Vortex. Temperatures have dropped to -21 at O’Hare Airport, which sets a record low for Jan. 31 in Chicago. The previous record low for Jan. 31 was -12, set in 1985. The all-time record low for any time in Chicago is -27. 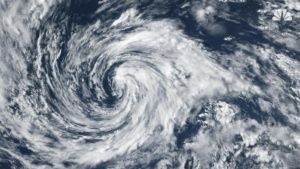 Frozen Arctic winds brought record-low temperatures across much of the US midwest on Wednesday, as a blast of Arctic air known as the polar Vortex unnerved residents accustomed to brutal winters. In the face of potentially lethal sub-zero cold the city has set up warming centers and non-profit groups have stepped up efforts. 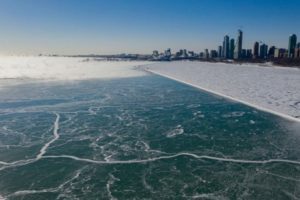 Locals have been warned “not to breathe deeply” outside as the freezing temperatures have led to Lake Michigan to solidify with mesmerising effect. The polar Vortex is wreaking havoc across the States leaving at least 12 people dead, including a college student who was found in the freezing cold at the University of Iowa. 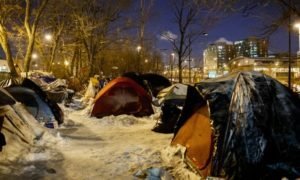 But as a deep freeze has plunged the city to historically frigid temperatures, Holleb has stayed in, sipping a hot coffee in the shelter’s common room and counting his blessings that he didn’t have to be outside in the potentially lethal cold. 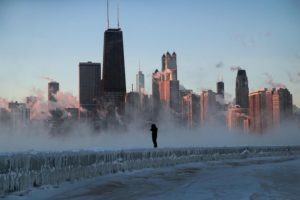 The blast of polar air that enveloped much of the Midwest on Wednesday closed schools and businesses and while straining utilities with some of the lowest temperatures in a generation as low as minus -45C with wind chill. At the moment, temperatures in Chicago are lower than both Alaska and Antarctica. 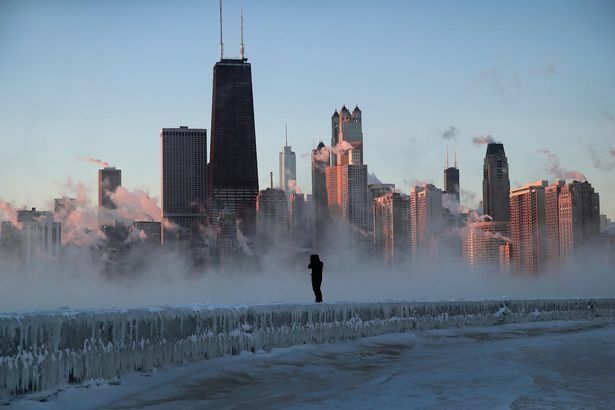 And signs of the bitter cold are all around — most notably surrounding the Chicago River, which is currently “smoking” and starting to freeze over while in the powerful polar Vortex’s grip. 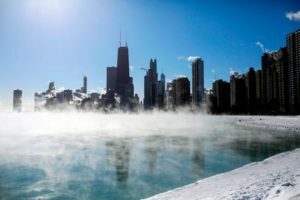 Aerial views of the Windy City reveal a large portion of the river is covered in chunks of ice and giving off swirling sea smoke, also known as “steam fog” when it occurs over freshwater lakes or rivers. However, it’s important to note that fog technically occurs when warm air meets cold water. The conditions snapped rail lines and saw thousands of flights cancelled.